Pastilla is an elaborate meat pie traditionally made of squab (fledgling pigeons). As squabs are often hard to get, shredded chicken is more often used today; pastilla can also use fish as a filling. It is typical of Morocco and highly regarded as a national dish of that country; variants are also found elsewhere in the Maghreb. 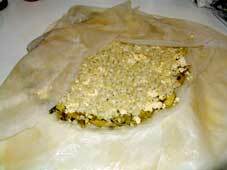 Left: Algerian-style pastilla nearing completion. It is a pie which combines sweet and salty flavours; a combination of crisp layers of the crêpe-like warka dough (a thinner cousin of the phyllo dough), savory meat slow-cooked in broth and spices and shredded, and a crunchy layer of toasted and ground almonds, cinnamon, and sugar. The filling is made a day ahead, and is made by browning the meat pieces in oil. The pieces are then transferred to a bowl, and with the remaining oil, onions, water, parsley, and various spices are cooked. The liquid is then chilled, and after, thickened to form a custard-like sauce with beaten eggs. The flesh and skin from the bones is shredded and added to the sauce, and it is chilled overnight. In a round pizza pan, the first dough layer is added, and butter brushed onto it. The cook adds the sauce over the dough, and places two more sheets on top. It is then dried, sprinked with confectioner's sugar and perhaps more cinnamon, and served.